In January 2018, far reaching assembly bill 1506 progressed as the latest attempt by assembly member Richard Bloom of Santa Monica. Along with his peers, Bloom has vehemently committed himself to repealing the Costa-Hawkins Act of 1995, which he believes has strangled California’s housing stock for over two decades. In a less than dramatic outcome, it lacked support to push through the first hearing. Republican Caucus members Steven Choi and Marc Steinorth opposed the measure, and have been vocal critics for some time. Only one supportive vote short, the bill would have likely made it through committee had Ed Chau and Jim Wood of the Democratic Caucus chosen to participate. This decision, like many before it, come at odds with the realities of living in a state that has long favored homeowners and branded itself as one of the countries least affordable places to live. The tradition to protect profits over livelihood, even if the commodity is a necessity for survival, has perpetuated preexisting exclusionary practices specifically aimed at working class and people of color. The historical struggle of housing insecurity seems only to slow during periods of increased regulation or financial downturn, suggesting a strong relationship between investment practices and market inflation. In fact, there have been more successful efforts at stripping tenant security than at strengthening, continuing to fuel housing woes. Large-scale natural disasters further typecast California landlords as obstinate to compromise for the common good. Chico’s North Valley Property Owners Association, which opposed a temporary rent control ordinance to protect displaced victims of some 14,000 homes lost in Paradise, proved themselves tone deaf to their neighbor’s cries for compassion. The turmoil of those at risk of eviction or displacement are evidently dependent on the unscrupulous property management practices of landlordism and speculative developers alike, not underperforming market production. Exemplary of this, housing oppression over the years has risen to unprecedented levels as homelessness and eviction rates skyrocket, becoming the most pressing public health crisis to date. With a statewide homeless population nearly the size of Pasadena, urban parks and underpasses have been informally subdivided at alarming rates as homeless encampments sprout to accommodate market failures. The lack of affordability associated in cosmopolitan cities like San Francisco and Los Angeles inevitably spilled out into public discussion as an omnipresent multi-regional issue. There is no argument that homelessness is a problem that must be stopped. But, depending on who you talk to, homelessness is either a crime or a symptom of something much more inauspicious. This lack of continuity renders litigation at a standstill. To the housing activist and academic world, Bloom’s efforts presumed to die a quiet death by the hand of real estate cronies, as the nature of our political climate prevents housing from being both affordable and a lucrative investment. In many ways 2018 acted as a tipping point in the war on classist housing policy. Almost immediately after the demise of Bloom’s AB 1506, grassroots movements began collecting signatures in an all out effort to breathe life into more aggressive repeal efforts during the midterm elections. Within months, Prop 10 collected nearly 600,000 signatures, establishing itself as a mainstream movement that breaks away from the orthodoxies of repressive housing policy. With this growing legitimacy, threats and misinformation spread pervasively as desperate efforts to shoot down the tentative legislation. Totaling in over $74 million, opposition to Prop 10 was primarily funded through wealthy developers and real estate investors. Under the veil ‘No on Prop 10; Californians for Responsible Housing, a Coalition of Veterans, Seniors, Affordable Housing Providers, Social Justice Groups, Taxpayer Associations, and Labor; Sponsored by the California Apartment Association’, lewd claims that the bill would hurt communities of color, veterans, and aging communities were used to leverage the very emotions that would inspire support. This deceitful mimicry undermined informed political participation, the very justification for the existence of democracy. If one thing is certain, Prop 10 was not a failure in the traditional sense. Although it did not pass, a formal foundation for meaningful change has been set for the future. Similar to the growth of Democratic Socialism in the 2016 primaries, conventional politics gave way to pragmatic non-partisan demands which have empowered working class suffrage on the left as well as the right. Mainstream support from the City of San Francisco, California’s Democratic Party, Nurse’s Association, Alliance of Retired Americans, and the AIDS Healthcare Foundation have enriched the fight to regain local authority over housing. 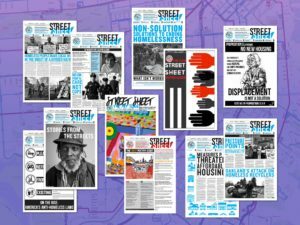 Groups like Tenants Together, San Francisco’s Tenants Union, Sacramento Tenants Union, and the Los Angeles Tenants Union have gained an immense presence on social media and in local participation. 2018 may have been the year Californians lost the housing rights battle, but they have not lost the war. Los Angeles County was able to pass a rental freeze ordinance, which temporarily protects unincorporated areas without any existing rent control. In Sacramento, a measure was placed on the midterm ballot to immediately regulate rental increases in the instance that Prop 10 were to have passed. The undeniable truth is that change is coming. It is very clear that the overwhelming need to protect renters has the wealthiest in this state shaking in their boots. If the best tactic to keep rent control off ballots is to confuse voters, there will come a time when this will no longer work. With renters now making up the majority in most California cities, there are far more in the housing liberation movement than there are in positions of power. Their fear is justified, it is only a matter of time.